If you are able to begin your treatment program at home, before your trip to St Andrews Clinic for vaccine-based immunotherapy, it is to your advantage to implement the immune-kickstarting dietotherapy ASAP. Your cancer diet is informed and inspired by the work of a legendary German doctor, Max Gerson, M.D., (although this is NOT the “Gerson TherapyTM”). “Diet” in the German sense of the word is everything pertaining to lifestyle, including the menu; but it also includes how the foods were grown, harvested, prepared, and served. These instructions will help as a guide to set up your home for healing. Note: the success of your immunotherapy depends in great part on your success with the cancer diet. Because your cancer diet is plant-centric, you will need to consume larger portions and more frequent servings than would normally be eaten. Please take only flax oil for salad dressing. You can add it to cooked foods, like potatoes, but it is not suitable for cooking. Please discontinue red meat for the duration of your therapy. Also, because protein restriction stimulates immunities, please temporarily suspend consumption of fish, fowl, dairy and legumes, which will be reintroduced at St Andrews Clinic. Please discontinue table salt, and all hidden sources of sodium (processed and canned foods, the foods of many restaurants). Please avoid manufactured foods, whether they are canned or frozen; fresh-frozen fruits and vegetables without preservatives are okay. Please avoid alcohol, bleached flour, white sugar, candy, cakes, pastries, coffee, and green and black tea. Please avoid all forms of pollution, including smoke, outgassing new carpets and upholstery, fresh paint, cleaning fluids, solvents, sealants, hair dyes, etc. Note: Although Gerson was concerned about berries and pineapple, the last half century of phytochemical research has vindicated them. Additionally, the medical importance of herbs and spices avoided by Gerson has been solidly established, opening the way for curries, southwestern foods, etc. As in the case of fruits and vegetables, herbs and spices should be organically grown. Please remove all pesticides, herbicides, solvents, adhesives, scented cleaners, paints, etc., from living quarters. Please remove salt, oils, processed foods, aluminum, Teflon, and cast-iron cookware from the kitchen. Please wash everything with “free and clear” detergents; clean drapes, floors, and walls. Please do not apply fresh paint, lay new carpets, or obtain new upholstery (they outgas), just clean what you have. Juicer : We have tested and are satisfied with 2 machines. The Jack LaLanne Power Juicer is fast and easy to use for under $100. The much more efficient, albeit much slower, wheatgrass-capable Omega 8008 (or higher) is about $300. Purified water: For home installation, units that combine reverse osmosis with activated-carbon filtration are cost-efficient and effective. Organically grown foods: Certified organic vegetables, fruits, legumes, nuts and seeds have been shown to have higher nutrient content than their commercial counterparts. Fish, fowl, eggs and dairy should likewise bear a label showing organic certification. Safe cookware (no aluminum or cast iron): Glass, ceramic, stainless steel, and green nonstick. 1. 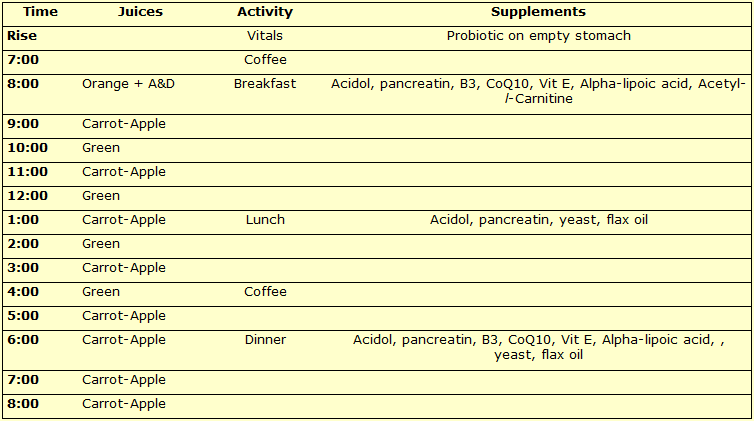 Juices hourly throughout the day to the capacity of the individual (see sample schedule below). 2. Vegetarian Meals (see sample menu, below). 3. Dairy, eggs, fish, fowl, nuts, seeds and legumes will be added once you begin Coley Fluid under medical supervision. For your kickstart, your anticancer immunities will be better served by a 2-week restriction of all of these protein sources. Probiotics: Take first thing in the morning on an empty stomach. Vitamin A & D: Serve in/with orange juice. Acidol Pepsin & Pancreatic Enzymes: Just before meals. Niacin: Begin with 50 mg 3 times daily with meals. Please note that a reddening flush of the skin, sometimes with itching and a sensation of heat, will probably occur several times. There is no harm in this; it is simply the opening of blood vessels allowing the flush. Increase by 50 mg per meal each day until you reach 150 mg. At that point, the next day you will switch over to twice daily, with only breakfast and dinner, starting at 250 mg each meal. Continue to increase at 50 mg per meal per day until you reach 1500 mg twice daily with breakfast & dinner. Please do not use extended-release, slow, or no-flush niacin, or niacinamide. Use only pure vitamin B3 in the form of nicotinic acid. Vitamin E: d-alpha tocopheryl succinate 1,000 IU 2/day (with breakfast and dinner). Alpha-lipoic acid: 600 mg 2/day. Citrus Juices: Squeeze with a reamer type juicer of glass, plastic, porcelain; electric citrus juicers are fine. Or you can peel the citrus and run it through your Lalanne or Omega juicer. Making juice for the day: People have long been instructed to make each of their juices fresh every hour, and to drink them immediately. Although the idea of immediate freshness is appealing, and the juices do taste best this way, many people will simply avoid the therapy because of this requirement. Or they will do it their own way. During our follow-back interviews of cancer survivors, we learned that quite a few of them made their juices in batches, storing them in jars in the refrigerator. 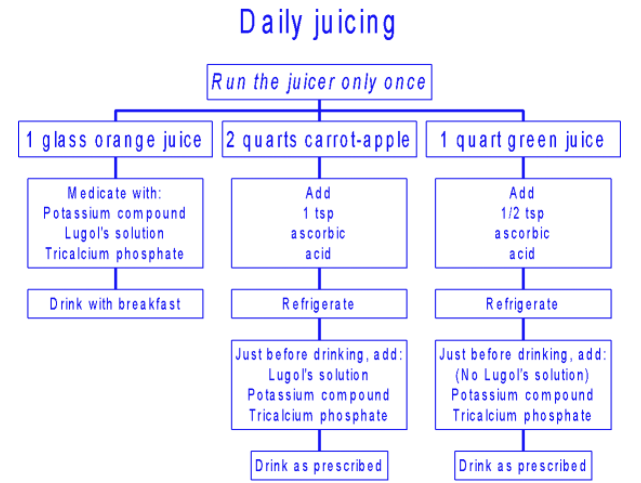 If you choose to emulate their winning behavior, we only recommend that you keep your juice fresh by adding 1/4 tsp vitamin C (ascorbic acid) per quart of juice (see chart below – and yes, we said 1/4 tsp, so ignore the level in the chart). It is instructive that the historical record reveals that Dr Gerson himself sent formerly bedfast, recovering patients back to school or the workplace with thermoses of carrot-apple juice. Not only was this necessary and beneficial for the patients, it was Gerson’s best advertisement. Please note: The following once-a-day juicing schedule medications are not prescribed for everyone; the schedule is presented here only for the purpose of batch juicing. Please do add the ascorbic acid (pure vitamin C). All vegetables should be carefully cleaned. Scrub, don’t peel, because important nutrients are in and right under the skin. All vegetables should be cooked slowly over low flame, with little or no added water. Slow cooking is very important in order to preserve the natural flavor of the vegetables while making them easily digestible. A stainless steel “flame tamer” can be helpful to prevent burning. A little of the Hippocrates’ Soup can be used, or tomatoes, apple slices, or chopped onion can be placed at the bottom of the pan to give up more fluid. Pots should have tight-fitting lids to prevent escape of steam. A trick for making a pot’s lid tight is to add a circle of waxed paper under the lid. Please don’t use pressure cookers. Bread: Grain is not considered a vegetable. Please do not replace vegetables with bread; and please don’t make a meal of bread. Occasional consumption of saltless whole grain bread after finishing juices, soup and vegetables is okay for those with strong appetites who are still unsatisfied after consuming all prescribed foods. Oatmeal: Oatmeal can be made in a variety of ways (3 examples below). Choose the one that best matches your taste. Recipe #2: Step One: Hippocrates Soup Stock: For two people use a large (4-5 quart) pot. Clean vegetables, chop, but do not peel. Cover with purified water. Simmer slowly for about 3-4 hours, then strain. Toss out the exhausted vegetables. Makes about 4 quarts of soup stock (2 days worth). Add the chopped vegetables to the stock, simmer slowly, until the potatoes are done. It can be served after being ground through a Foley food mill (the traditional way), put through a blender, or eaten as a chunky stew. Use within 3 days. *Note: The basic idea is to consume 1 Cup of the soup stock and 1 Cup of fresh vegetables 2 times per day. The medicinal ingredients of “Hippocrates Soup” are leeks, celery root, and parsley root. The potatoes are for calories and protein. The onions and tomatoes are added for flavor! The flavor is optional. The following suggestions are very different in flavor, they are simply suggestions to get you started. Have fun with this — experiment! Enjoy! Italian Tomato Soup: Per 1 Quart soup stock add: 1/2 Cup of sliced potato, celery, and green beans. Allow to simmer til tender. Add: 1/2 Cup sliced zucchini, bell pepper, tomato, 1 clove garlic, fresh onion. Soak sun dried tomatoes in stock then blend in blender and add to soup. Herbs: basil, oregano, rosemary. Oriental Soup: Slice vegetables very thin, julienne: celery, bell pepper, zucchini. Add sliced Jerusalem artichoke, mung bean sprouts, sliced cabbage. Add lemon juice and garnish with green onions and fresh cilantro. Orange Soup: To Soup Stock, add sweet potato, potato, squash, and carrots. Add a little cumin and ginger. And just before serving add the juice of one orange. Broccoli Soup: To stock add broccoli stems, potato, apple, celery, and onion. Grind in blender, return to heat and add broccoli tops ‘til just tender. Coffee Enemas: An important part of your protocol is frequent detoxification of tissues and blood by coffee enemas, which cause stimulation of enzyme systems of the gut wall and liver and promote excretion of toxic bile. Chamomile Tea: A soothing and relaxing tea. It can be taken orally, sipped hot as any other herbal tea, sweetened with a bit of honey and lemon. It is sometimes used as an enema to soothe the colon; sometimes alone, and sometimes combined with the coffee enemas. Peppermint Tea: Helps with nausea. Sip as much as desired throughout the day and evening. During reactions, drink as much as possible. Pain Triad: The pain triad becomes progressively more effective as the body undergoes detoxification. It can be used at bedtime to assist in going to sleep for those patients with substantial pain. Triad Dosage & instructions: The triad should be used sparingly. Please do not exceed 6 doses in a 24 hour period unless prescribed by your physician. 50 mg niacin + 500 mg ascorbic acid + one 5-grain aspirin ( one standard tablet). We recommend S. A. Wilson’s specially selected and roasted coffee, which is higher in active ingredients than all other organically grown coffee (http://sawilsons.com). This is because Wilson’s beans are chosen for their high active-ingredient levels, and are then roasted only enough that they can be ground. This results in a blond coffee that smells like peanuts and is not at all palatable for drinking; however, the light roasting process preserves the medical benefits of the beans. The darker the roast, the less medical benefit. Regular-roast coffee requires 3 heaping Tbsp per dose. Wilson’s requires only 2 Tbsp per dose. Combine 2 measuring cups of Wilson’s coffee (2 heaping Tbsp/dose) and 10 cups distilled or purified water in a large pot. Place over high heat, uncovered. Bring to a rolling boil for 5 minutes or until foam is visibly decreased. Tightly cover, lower the heat, and simmer for 30 – 60 minutes. When it is completely extracted by simmering, Wilson’s coffee darkens to a tan that, interestingly, lightens as it sits. Strain – Please do not filter coffee through paper, because the medical elements are associated with filterable microfibers, and paper filters remove almost all of them. Replace water that has boiled away by rinsing grounds and straining into container of concentrate. You should finish with 10 cups. To use concentrate: Combine 1 Cup concentrate + 3 Cups purified water (warm enough to make solution slightly warmer than body temperature, 103-104°). For instructions for administering coffee enemas, see below. This special coffee will produce a green stain if spilled and allowed to dry on a white surface such as porcelain; however, this is nothing to worry about. Like the brown stain of roasted coffee, it is difficult to remove from light fabrics. This recipe can be used either as a tea to drink, very soothing, comforting — or as part of an enema to soothe the colon. Place flowers in boiling water and allow to boil for 5 minutes, strain. Follow instructions for chamomile tea (above) but replace chamomile with 4 Tbsp dried peppermint leaves. Now is time to get into the habit of taking your temperature and pulse upon rising each morning. Set your thermometer and a clock next to your bed. Bring this record with you. It will help the physician making an assessment of your current metabolic status. Juicer: Despite the traditional use of only the Norwalk or K&K juicers with separate grinder and press, we have found the LaLanne and Omega juicers to be adequate to the task. Citrus reamer type-juicer, manual or electric. Organic Coffee: Coffee should be roasted as little as possible (avoid dark roast, because about half of the medical chemicals in coffee are destroyed by dark roasting). Organic coffee is widely available. We always recommend (http://sawilsons.com), but it will take a few days to arrive — so in the interim, the above guidelines will help you find a short-term substitute. Enema Gear: Enema buckets with accompanying tubes are sometimes available at health food stores —hot water bottle/ enema douche bags which can be used (available at pharmacies). Buckets are also available here: (http://sawilsons.com). The following list of supplements may not apply to everyone; they represent our toolbox: We have found suitable supplements at COSTCO, Trader Joes, health food stores, and online vitamin suppliers (we have had a good relationship with Vitacost.com).